Gorman-Rupp SF Series® submersible solids-handling pumps are designed to provide you with the ultimate in pumping performance. 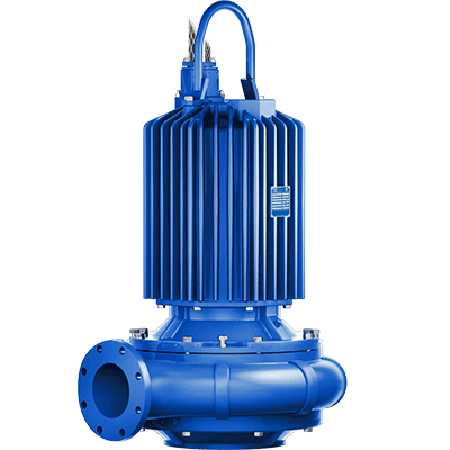 All SF Series pumps use NEMA Premium Efficiency motors and pass a minimum 3" spherical solid. Vortex pumps use the patent-pending Staggerwing® impeller technology. SF Series submersible solids-handling pumps are available in slide rail and construction / trash versions for use in most liquid removal applications. The SF Series comes with 3", 4", 6", and 8" flanged discharge and power ranging from 3 - 75 HP (1.5 to 56 kW). These combinations will provide flows up to 3,100 gpm (195.6 lps) and heads to 190 feet (57.9 meters). Built to the same exacting standards you've come to expect from our industry-leading self-priming pumps, SF Series pumps are designed for easy maintenance and constructed for long life. SFV vortex pump models feature the patent-pending Staggerwing impeller. The impeller enables higher pump efficiency and the ability to pass 3" spherical solids. Pump models are available up to 30 HP.